Little Giant adjustable sheet and panel truck. Ideal for large or small quantities of plywood, drywall or other sheet material. Includes two heavy-duty uprights that extend 27-inches above the deck and can be placed in any of four positions. 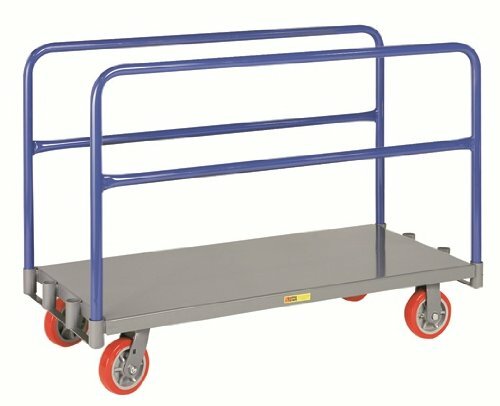 Also great for rolled goods, office partition panels, folding tables or use as standard platform truck. Two rigid and two swivel casters with choice of wheels provide plenty of carrying capacity. This truck comes with non-marking polyurethane wheels. 3600 pounds load capacity. Platform measures 48-inches length by 24-inches width. Polyurethane wheels features easier rolling for higher capacities, long lasting, chemical resistant, non-marking and quiet operation. High strength polyurethane tread liquid cast and mechanically locked to a polymer or cast metal core. A polyurethane tread is superior for industrial, warehouse and institutional applications with a great combination of easy rolling and maneuverability under heavy load capacity while able to quietly roll over rough floor surfaces. Comes with non-marking polyurethane wheels, durable powder coated finish.